Tomorrow is the Super Bowl. For many, that means some great commercials. For fans of football, it’s billed as possibly the closest match-up in the history of Super Bowls. For fans of two geographic regions, there’s a little more on the line. 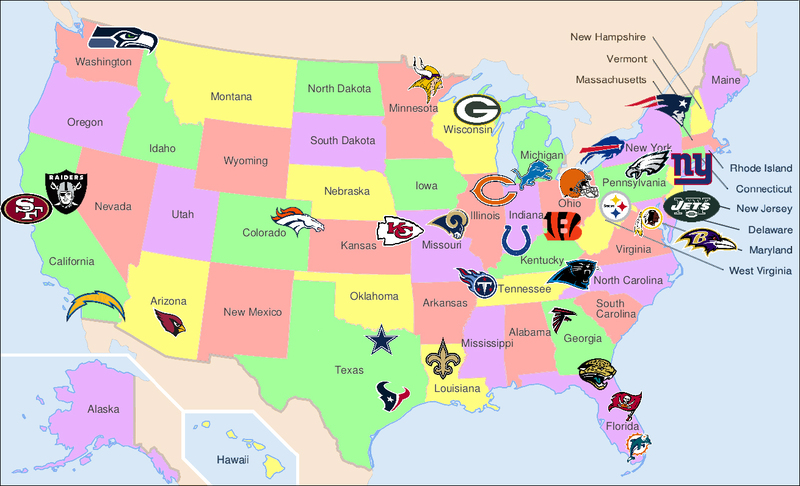 If you look at geographic map of NFL teams there’s no franchise close to Seattle. On the other hand, the New England Patriots are the only team named for the geographic region they represent. It wouldn’t be a stretch to say that each team represents 5 states, which is interesting. For me, a Boston native, it’s in a whole new stratosphere. I’m a huge fan of football and who doesn’t like funny commercials? Given the above, I consider it a national holiday unlike any other. I like to think that with the commercials, it at least has something for everyone. For the people interested in the game, I thought I’d provide a lot of analysis and a prediction. I don’t think my analysis will be unique in any particular way, but I’ll cite sources from quite a few different sites. Quite often big media sites will stick on only showing information from their own authors. I have no skin in the game, so everything is fair. I thought I’d start off by analyzing each position overall and giving them a grade from 1-10. Much of this analysis relies on the awesome premium stats from ProFootballFocus. They are a little pricey at $27 a year, but I find it the most valuable resource for looking up a player and seeing what his talent level is. Plus, I like to reward people who do great work. Typically most analysis would start at the quarterbacks, but this is one of the most interesting match-ups due to the extreme talent on both teams. Seattle: 9 – They have three Pro Bowlers in the secondary, Earl Thomas, Richard Sherman, and Kam Chancellor. Typically they’d get a perfect 10 score, they are truly that good. However, each of them is playing at less than 100% health. They will all be on the field, but I have to take their grade down a notch to account for the injuries. New England: 9 – They have Pro-Bowler Darrelle Revis. Their safety, Devin McCourty tends to get snubbed from the Pro-Bowl, but he’s good enough to grade better (using PFF) than Seattle’s Kam Chancellor and just a little below Earl Thomas. Brandon Browner isn’t in the top tier like the previous players at his position, but he was part of Seattle’s great secondary last year. I would consider the weak spot to be Patrick Chung, but he’s graded extremely well this year also passing Kam Chancellor. It’s strength on strength. If both sides were healthy, I’d give Seattle a slight advantage. They aren’t, so I’ll call it a draw. Seattle: 9 – K.J. Wright, Bruce Irvin, and Bobby Wagner. Wright and Irvin are rated as the 6th and 11th best outside LB in all of football according to PFF. By the same metric, Wagner is the 5th best inside linebacker in all of football. Consider that there are 32 teams and they typically have two starters in each position. Any of these players would be the best on 80% of the teams. New England: 9 – Dont’a Hightower and Jamie Collins aren’t household names, but they were rated the #2 and #3 inside linebackers in the league on PFF, putting them ahead of all of Seattle’s linebackers. You are right to ask about the third, but I think the Patriots will play a 5-2-4 base defense for much of the game. If captain and Pro Bowler, Jerod Mayo didn’t get injured earlier in the season (he’s out for the season), this unit would be a 10. It’s another draw, but it’s notable that Seattle has three great players here and New England has two. New England has some make-up work to do when we look at the defensive line. Seattle: 8.5 – I’m not as familiar with Seattle’s defensive line. Michael Bennett and Cliff Avril are well-known stars. Bennett in particular stands out as Seattle’s defense’s greatest rated player. Their pass rush will be a key to Seattle being successful. It looks like Seattle rotates a few players who are close to average or even far below average in the case of Tony McDaniel. Two great players and some fresh legs and I’ll give them the benefit of the doubt of an 8 grade. However, given that a pass rush is critical to stopping New England and it’s the strength of the two great players, I’m bumping it up to 8.5. New England: 7.5 – I think the Patriots will use Chandler Jones, Rob Ninkovich, Vince Wilfork, Sealver Siliga, and Alan Branch in this role. On any given play Jones and Ninkovich might be considered linebackers. It’s hard to say. I think they’ll go with Wilfork, Siliga, and Branch as they clog up a lot of space averaging around 325lbs. We’ll get to it later, but stopping Seattle’s running game is going to be a focus for the Patriots. These 3 amigos are their best chance at that. Siliga and Branch are closer to average players. They won’t be disruptive in rushing the passer, but they play the run well, which is what New England needs most in this game. Jones and Ninkovich are both very good players. They will be asked to “set the edge” which means not allow Seattle to run outside and move the ball up field. Jones was injured for 7 games in the middle of season, but has come back strong since then. That might be ideal, as he is fresher than most players. If he played the full season, he would have projected to grade better than Devin McCourty above, which makes him a Pro Bowl-level talent. Ninkovich’s season was closer to average, but he’s typically a small notch below Pro Bowl-level. He is coming off the single best game I’ve seen graded by PFF. I’d give them a 7 on talent alone, but I’m bumping it up to 7.5 because they are better against the run, which is critical for this game. Seattle: 5 – The players with the top 5 amount of snaps all have negative grades according to PFF. Max Unger, #6, missed a lot of time with injury, but he’s the star of the show with great run blocking. The grading all over the offensive line for PFF is filled with red. New England: 5 – The tackles, Solder and Vollmer are particularly good players. Solder started off badly this season, but he’s righted the ship for the most part. Vollmer might be the best RT in the game. The Patriots interior offensive line is more of question mark. That question mark centers on whether rookie Bryan Stork is going to play or not. If he’s healthy enough to play the Patriots the offensive line is better. If he’s not, the Patriots juggle around few interior position players. That’s so much writing and that I’ll just say it’s probably worth a half point on my 10 point scale. It is worth noting that PFF has Dan Connolly graded so horribly, (really, really bad) it’s a bit of a head-scratcher for the captain of the line. While I’m giving the Patriots a 5, they can often be more than the sum of their parts. They work together well. At other times, such as the last two times the Patriots were in the Super Bowl, a strong 4-man pass rush can take over the whole game. I’m going to also factor in Tedy Bruschi’s Offensive Line Index. Unfortunately, it was last updated in early December. It is less than ideal, but still better than not using anything. That’s a decided advantage for Seattle. What’s interesting is that the Bruschi’s Index indicates that Seattle is the worst in the league in pass protection. Seattle’s game is to run the ball, but if they get forced into a situation where they have to pass, that could be a problem. At the end of the day, I’m going to call it a draw. I’d say that Unger and Vollmer + Solder balance each other out and no one else seems to be good enough to move the needle. Seattle: 10 – I thought about giving “Beast Mode” a 9.5, but then I decided that he does everything that Seattle needs and is by almost any account at least a top 3 running back in the league. New England: 9.5 – Some may say that I’m off my rocker with this one. However, LaGarrette Blount has been even better this year, when he plays. PFF has grades for when he was with the Patriots in the regular season and grades for all his games including playoffs and including games for Pittsburgh. By either measure he scored better per snap than “Beast Mode.” It’s not just from these two small samplings either. He was great with the Patriots last year. Seattle gets the edge, because “Beast Mode” has done it a lot longer. I’d give him a bigger edge, but Blount has graded even better in as many snaps as over his last two years. Seattle: 3.5 – It may seem harsh, but only Doug Baldwin receives a positive grade from PFF. Most expect him to be sacrificed to Revis Island. Even TE Luke Willson receives a negative grade. New England: 8 – After Tom Brady, Gronk is the highest rated offensive player in the game. He’s such a mismatch that teams have to devote more resources to him, which opens up opportunities for others. I find it inexplicable that Julian Edelman received a negative grade while LaFell earned a positive one. Both were less than 50 yards from being 1,000 yard receivers and each more than a 100 yards than Baldwin, Seattle’s best receiver. While Shane Vereen is running back, he’s particularly dangerous as a receiver with 52 receptions. That isn’t too far from Doug Baldwin’s 68 receptions. Seattle: 7.5 – Russell Wilson is rated 13th just below Ryan Fitzpatrick, which is odd. He’s also rated above Joe Flacco, who almost knocked the Patriots out of the playoffs, so there’s that. It’s not just PFF rating Wilson in that area, ESPN’s QBR has him rated 12th. Wilson is dangerous running the ball and passing on the run. New England: 9.5 – The real “12” in this game is probably the best quarterback to ever play the game. (Okay, I’m a little biased, but every measure has him up there.) Brady is the 4th rated QB according to PFF and 4th in ESPN’s QBR. He should get some MVP votes and he’s the highest rated offensive player in the game. Due to Seattle’s injuries, it’s wash in the secondary. If we pretend that Chandler Jones is linebacker (as he sometimes is) it is a wash there as well. Seattle has a small advantage on the defensive line. There’s a lot of focus on Seattle’s Legion of Boom with what they did to Denver’s historically good offense last year. It’s well-deserved and I couldn’t respect them more. However, the Patriots were very good as well. The Seahawks gave up 15.9 points per game and the Patriots gave up 19.6. Clearly that’s not as good, but New England had a more difficult schedule, with 12 of their games coming against the top 16 teams to only 9 of Seattle’s. It feels like New England faced better offenses having played Denver, Indy, and even Sand Deigo when they were clicking. Both teams had to play Green Bay, so it’s a wash. Seattle got to play the 2nd and 3rd string QBs in Arizona and St. Louis… and SF was worse than both of them. To put it in perspective, the Patriots had to play Miami twice who had a similar offense (in terms of scoring) to the Seahawks. Many analysts say that defense beats offense and use that as a reason for picking Seattle. I think such analysis might be swayed by Seattle’s outstanding performance in last year’s Super Bowl in combination with the Patriots having been one of the best offenses over the last several seasons. When the defenses are this close to equal, it simply isn’t that simple. Seattle’s scoring offense was 10th with 24.6 points per game. New England was 4th with 29.3 points per game… and that would have been higher if they didn’t sit Gronk in a meaningless week 17 game (and Brady for half of it). Seattle doesn’t try to hide it. They intend to run the ball. Usually it is with “Beast Mode”, but quite often Wilson will do the work. The problem is that their passing game is average at best. New England’s offense can do almost anything. They can passed almost exclusively to beat the Ravens in the divisional game. They put up huge yards on the ground running against the Colts. I’ve overlooked Special Teams to this point, but the Patriots have won games with that as well… both with blocking and returning kicks. It’s a big advantage to have the best QB, best offensive line, and best receivers. It more than makes up for the slight edge Seattle has at running back. 1. The best way to beat the Patriots is to pressure Tom Brady with a 4-man rush, leaving 7 out in coverage. Brady is great when a team blitzes a 5th man. Unfortunately for the Patriots, Seattle’s Bennett and Avril are good enough to provide that pressure. 2. Perhaps equally important is to stop the Patriots run. The run shouldn’t be decimating like it was against the Colts. Instead, Seattle wants to force the Patriots into being one-dimensional, so that they lose the threat of play-action, which is another area where Brady is magnificent. 3. I’ll throw in the obligatory, “stop Gronk.” However, the Patriots can win if Seattle over-focuses on Gronk leaving other players open. If stopping Gronk means doubling him with Wright and Chancellor, the Patriots may be happy with what it opens up elsewhere. 1. Beast Mode plays the game of his life. We’ll cover this when discussing New England’s Defense, but Belichick takes away what a team does best. It almost never beats him. He shut down Marshall Faulk in Super Bowl 36 and Lynch is no Faulk. He did that while having to shut down two Hall of Fame quality receivers too. If Beast Mode can beat Belichick, Seattle’s odds of winning increase dramatically. 2. Hit some big plays. Seattle knows the Patriots’ Browner as he used to be a Seahawk. They know he commits a ton of penalties. They may decide to just throw it deep and hope for either a catch or a penalty. Wilson has been known to connect on some of those deep balls in the past. 3. Use Wilson’s legs. The Patriots will try to contain him, but when he’s scrambling around almost anything can happen. While we might not see another helmet catch, if some of those plays work out for Seattle, they’ll put points on the board. 1. Stop “Beast Mode.” Seattle fans may be thinking, “Good luck.” Belichick will focus on it. I see the big three that I mentioned above clogging the middle and Jones and Ninkovich setting the edge. Patrick Chung is PFF’s 3rd rated safety at stopping the run with Hightower and Collins the 5th and 6th best inside linebackers against the run. To make matters worse for the Beast, Seattle’s wide receivers aren’t talented enough to draw attention away from Belichick focusing on him. As Football Outsiders points out, the Patriots have the best run defense in the league since their week 10 bye. That Football Outsiders article has incredible analysis and is well worth a read. If there’s one team that might be best suited to stop “beast mode”, it might be New England. 2. Stop Wilson’s scrambling and big plays. The Patriots have faced a QB like Wilson all year. Belichick has stopped Vick when he was in a Falcons’ uniform, so he’s seen better pure running quarterbacks. The question is how you stop both Wilson and Beast. Fortunately the answer for each of them is devote more people to the line of scrimmage and let your awesome secondary handle Seattle’s receivers. 3. Don’t get beat by “the catch.” The last two Super Bowls were highlighted by nearly impossible catchers. The first the helmet catch by Tyree. The second by the long sideline catching by Manningham. By almost all accounts it is going to be a close game so a play like this could be the difference of whether we are talking about Brady being the best QB of all time or losing three straight Super Bowls. It’s insane, because he wasn’t on the field for either iconic catch. People magnify a few plays in a Super Bowl to overshadow a whole career with thousands of passes. This is the match-up that I think everyone wants to see. It’s strength vs. strength. One of the best offense’s vs. the best defense. We saw a little of it a couple of weeks ago with Seattle and Green Bay, but this is a neutral field and not an injured Aaron Rodgers. Also Seattle’s defense was more or less at full health. 1. Test the injuries. Can you get Blount into the second level to test Thomas’ shoulder? Can you run a screen to Edelman to force Sherman to make a tackle with his elbow? Is Kam Chancellor’s knee going to slow him down in stopping Gronk. 2. Use the Camelion. The Patriots morph their offense to whatever the defense’s weakness is. The only problem is that Seattle doesn’t have much unless the key players are more injured than they let on. So how the Patriots change their colors to find something that Seattle doesn’t do well. I’ve read that they aren’t great on short passes, which is something that is a Patriots’ specialty. Perhaps that works for them. 3. Protect Tom Brady against that 4-man rush. Yes, find some way to stop Bennett. 4. Bring the Attack of the Lilliputians. I have to think that Seattle is going to double Gronk with Wright and Chancellor. They leave Sherman on the same side all the time, so the Patriots can almost pick who they are going to sacrifice. My guess is that they go with LaFell there. That leaves 3 small players… IncrEdelman (or Minitron) to work against Seattle’s weaker corner. It leaves Amendola to work against their 4th corner. Vereen is the third option and the Patriots could even option him and go empty backfield. The problem with this is Seattle’s other great linebackers, but these 3 amigos have a lot of jitterbug in them. Linebackers usually don’t have the agility to keep up. The Patriots are pissed off about the whole DeflateGate thing. When SpyGate happened, they responded with such incredible play that people got mad that they ran up the score. Earlier this year when critics claimed they were a “weak team” after losing big in Kansas City, they responded with an almost perfect game against Cincinnati. They have only lost twice since… an equal battle in Green Bay (the team that should have knocked off Seattle last week) and the last week of the season where they sat their players. The lesson is that you don’t want to make Belichick and Brady angry. It makes the Patriots at least 38% better than they normally are, which is by far the best team this millennium. And when all other analysis fails, I find that the nationally recognized ones from Rick Gosselin. Add in the Patriots’ fire under DeflateGate, and I don’t see it ending well for Seattle. I’ll go with Patriots 24-16. P.S. I expected to tie in more sources when I started, but it took hours to write this. I seriously doubt you are looking to read even more analysis. The Super Bowl and the weekend is over… I’m not going to let it go that easy. It’s always been my stance that with the exception of Independence Day, there isn’t one day that unites America more than the Super Bowl. Even people that don’t like football tune in to see the half-time show and the commercials. The people who decide what’s a national holiday should just get together and make Super Bowl Sunday official… complete with the following Monday off. Watching this Super Bowl was a little different for me. Hanscom Air Force Base was a big event so we went there. I don’t know if ever been to a party where the people are too generous, but this was such an occasion. Everyone in attendance, probably 125 people, had to have walked away with a raffle prize. We walked away with this specialty brownie pan and a slightly different brand of this giant cupcake pan. There was so much free food that they urged people to take some home afterward. We’ve got meatballs for a few days. The beer? It was $10 for a 16 ounce cup that gave you all you can drink access to the keg… just go pour your own from the tap. While pouring mine, I relived a few college weekends by closing my eyes and think pretending I was in a dank basement with a radio playing Everclear’s Santa Monica. It was about the same quality beer too. I’m not one to be a beer connoisseur, so the light and refreshing domestic stuff worked for me, especially with everything else going on. The Super Bowl got things started off right with kids from Sandy Hook Elementary singing with Jennifer Hudson. My wife was quick to remind me that there’s a connection of gun violence between them. As we’ll cover a little later, I’m a big sap for things like this. It’s good for the kids and it looks good for the NFL. While on the topic of looking good, I know that Subway celebrated 15 years of Jared last night, but Hudson has gotten and stayed in shape for a long time now. The National Anthem started and everyone on the base stood and was silent. I wonder how many places outside of military bases had that happen. I went to a movie on the base a month ago and they played the National Anthem before the movie with the same reaction. It was a great of respect. A lot has been said about Alicia Keys’ rendition being too slow and I have to agree. It seemed like she was purposely trying to draw it out as long as possible. Also, was that an extra line at the end? You are Alicia not Francis Scott. Like most people, I’ve never raised a horse. However, I’m in year four of raising a dog now and we went through a lot of the same things in the video. Last month, we took Jake to a local dog park, only to find that it wasn’t fenced in. We’ve only let him be off a leash in public a couple of times and it always makes us a little nervous. He’ll chase a squirrel across a highway without thinking twice. My wife dropped Jake and me off while she parked the new car and was to come with our baby. Jake played with the other dogs for about 20 minutes and then got bored and started running towards the parking lot… the one place in the acres of forest that presented the most danger. Of course his four legs are faster than my two, so he easily got by me and no one else seemed to care that this dog was running unattended. Suddenly he picked up speed as he made a dash for the parking lot, stretching the distance between us from 2 football fields to 3. He continued to the parking lot and straight into my wife’s car. She couldn’t find a place in the far parking lot and was circling to find a spot in the near one. It’s not exactly like the commercial, but it felt the same. It’s one thing to watch a commercial like that. It’s another to watch it on a military base where it could apply to dozens of the people there. Is it any surprise that I had Subaru split their charitable donation between the ASPCA and the USO when I bought my car? It was long and it was good. I know it’s not what you’d expect from “Lazy Man.” I have great respect for the un-Lazy. A lot of people thought that the half-time show was really well done. I thought it was okay. It hit my expectations considering that most of it was dancing in front of a video screen. Nothing stood out to impress me like the 88,000 Chinese people drumming (or whatever it was) for the Olympic opening ceremony. I would have settled for some kind of flip, I’ve seen a mid-50’s Steven Tyler do it, so why not Beyonce? While on the topic of the half-time show, here’s a random statistic that you may find interesting. Patriots beat reporter Mike Reiss noted that of 22 assistant and head coaching positions open this offseason, three new minorities added to the coaching pipeline. With Hudson, Keyes, and Beyonce, the NFL had the same number of minority singers for the Super Bowl. Seems like too little diversity in either. The power outage certainly brought some excitement to the game. I was stuck wondering why they were keeping the focus on the announcers and the game when they had little to report. If it were me, I would have cut to some commercials. I know the commercial time slots were well planned in advance, but CBS should have taken some contingency commercials for such situations (or even overtime). Lazy Man and Money will start the bidding at $100 for a slot that comes up to unforeseen circumstances. I’m a few companies will outbid me by a few hundred thousand dollars, but that could have been all profit for CBS. As for the game itself, if you stuck around past the power outage it got really good. However, for the second consecutive time, it ended with the team I had an affiliation with losing. I have a lot of disappointed friends back in San Francisco. The important thing to remember is that 31 teams are going to be less-than-pleased with how the season ends… and the draft is only a couple away.